The Tailored Woman is devoted to the longtime women's specialty store at 57th and 5th known for "good style, good lines, good quality and quiet colors." Fifth Avenue buses may be used as mop wringers; the doorman for the Tailored Woman shop carries a dripping mop to the curb and puts it in front of the right rear wheel of the bus waiting for green light. I've watched Breakfast at Tiffany's too many times to count. I don't agree with Wasson's assessment (and that, apparently, of the movie's producers and costars) that George Peppard was a weak link as the love interest of Audrey Hepburn's character, Holly Golightly. He is slightly wooden, but for me it works for his character, a conflicted young would-be writer who believes himself to be an upstanding citizen even as an older woman (the splendid Patricia Neal) keeps him as her plaything. Another eBay find: this ad from a 1964 Vogue. Now I know that fur is a no-no, but I had to have the ad because it shows the Tailored Woman store and its famous display windows. My thoughtful cousin just bought this Tailored Woman hat and hatbox for me at a vintage store on Etsy. I love it! Can't you see me walking down Michigan Avenue in feathered splendor? "Vixen" is such a great word. I knew it meant a female fox, but I was surprised that "a shrewish ill-tempered woman" is the first definition, followed by the more popular usage, "a sexually attractive woman." Hmm. Interesting that those two are so closely linked. Misogyny? Fear? Well, best take cover when I get my feathers on and head out on the prowl! We remember trying to write a letter to Hunter College & getting stuck because we couldn't think of the proper salutation. A friend of ours got into the same kind of a jam the other morning when he foolishly attempted to compose a letter to the Tailored Woman, Inc. "Dear Sir," didn't sound right, neither did "Gentlemen," "Dear Madam" had a fishy ring. "Mesdames" made him dizzy. 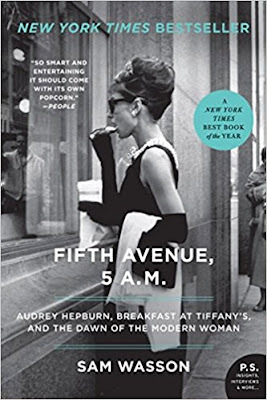 He tried "Dear Tailored Woman," "Dear Incorporation," "Dear People," and "Friends on Fifth Avenue." All of a sudden the answer burst on him. "My Good Woman," he began. "May I bring to your attention..."
As for this good woman, I'm off to New York in the morning and will certainly be visiting some old friends on Fifth Avenue! I've heard from a number of people who remember the Tailored Woman store and its mercurial owner, Eugene K. Denton. I received the following message a few months ago from Diana Pons, who gave me permission to share her story. My father, Victor Pons, was the maitre d' of the Oak Room at The Plaza Hotel on 59th Street and Fifth Avenue, just steps from The Tailored Woman. 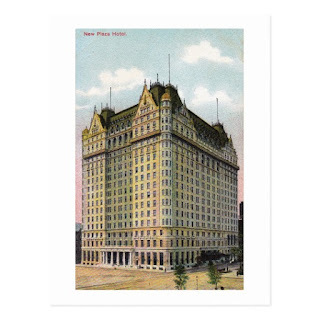 I am writing a book about my father's years at The Plaza (1953-1973) and the many experiences he, and I, had there. I was trying to remember when The Tailored Woman closed. I just Googled the store's name and I found your web site! 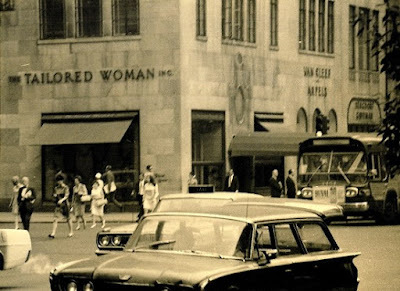 I received permission from the generous and talented Dave Hay to post this photo of the Tailored Woman store, taken as part of a series of photos of Midtown when Dave was newly-arrived in the city in 1967. I love this shot of the corner of 57th and Fifth. The building, which still houses Bergdorf Goodman, looks very much the same today. The Tailored Woman is a Philadelphia-based writer whose interests include travel, dining out, classic cocktails, vintage-inspired fashions, monkeys and books. She is the great-grandniece of the founder of the Tailored Woman, the legendary New York women's specialty store.